Happy St. Patrick's Day everyone! We are having a special sale today and today only for all visitors. 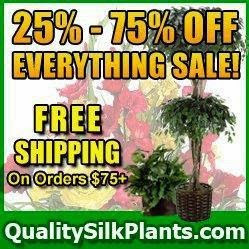 Just start adding silk plants, flowers and artificial trees to your cart and watch the savings rack up. With our super sale going on we are also offering an additional 7% off the lowest sale prices today only so hurry and get shopping today as spring is just a few days away!